Electronic Arts Chief Creative Officer Rich Hilleman doesn't think that SimCity and Battlefield 4 had bad launches and he doesn't seem too concerned about the upcoming release of Titanfall, either. You may recall, if you've been paying attention over the past year or so, that neither SimCity nor Battlefield 4 had what you'd call especially smooth rollouts. SimCity collapsed under the weight of server demand and controversy over whether or not those servers were really necessary in the first place, while Battlefield 4 was just a disastrously bug-ridden mess. Each dealt a serious blow to EA's credibility as a game publisher capable of a certain baseline of competence, but speaking to Rock, Paper, Shotgun, Hilleman suggested that the company doesn't actually see them as a problem at all. "I'm not sure I accept your premise [that SimCity and Battlefield 4 had bad launches]. 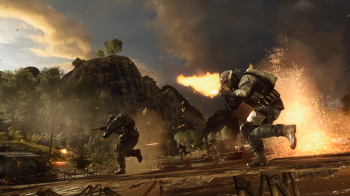 Battlefield 4 has been an exceedingly successful product on both consoles and PC. From a sales perspective, from a gameplay perspective," he said. "I think there was a lot of noise about the game, but some of that is a function of your surface area. The more customers you have, the more noise becomes available. We did things wrong. We know that. We're gonna fix those things. We're gonna try to be smart about what customers want in the future." "But I'm not willing to accept - and I don't think most of my customers are willing to say - 'It's a bad product, I wish I didn't buy it'," he added. "That's not the conversation we're having now. I think what we're hearing is, 'You made a game we really liked. We would've liked it a little better if it didn't have these problems'." A willingness to fix things is always good, but it's of no use if you don't actually recognize what's broken. These games weren't just a little rough in one or two particular areas, they were fundamentally broken and did not work as they were intended - and that, it can very reasonably be argued, makes them "bad products." Hilleman presumably wasn't accompanied by a handler during the interview, because his response to a question about why gamers should expect different (and better) things from the Titanfall launch was more than just a little dismissive, too. "Titanfall is made by a different organization. Respawn has very firm control of their project," he said. "Best I can do for you." Well then, I guess that's that. But I really hope that's not actually the best EA can do for us.